Have you ever wondered what the most complained about consumer issues are? If you have, it probably won’t come as any surprise to learn that the Consumer Direct advice service reported that second hand car complaints topped the list of consumer woes in the last year. Complaints to the service about second hand cars bought from independent dealers topped the list of complaints recorded by advice service Consumer Direct for the fourth year in a row. The advisors at Consumer Direct have certainly been kept very busy with complaints and enquiries in the past year, as they report that they have answered more than 1.5 million calls and emails in the 2009 calendar year. Encouragingly, the figure was less than the previous year, down four per cent, but almost 850,000 complaints against traders were made to the service. Consumer Direct is run by the Office of Fair Trading and offers a telephone and online service giving consumers information on their legal rights along with practical advice on resolving disputes. If such as specialist advice is needed, Consumer Direct also refers complaints to their local authority Trading Standards Services or to another relevant organisation that can help them. Overall, Consumer Direct received a total of 50,790 complaints just about second hand cars bought from independent dealers. This figure was up by eight per cent on the previous year. 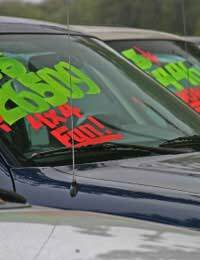 If you have a complaint about a used car, you are protected by the Sale and Supply of Goods Act as long as you purchased it from a dealer. It doesn’t matter if the dealer is an independent or a large franchise, you are entitled to a car that is of ‘satisfactory quality’ and your contract is with the dealer and not the manufacturer, so don’t be fobbed off with manufacturer’s warranties if you bought from a franchise. If the car is used, that aspect also has to be taken into consideration when you’re asking for redress – the key term is ‘reasonable’ and therefore if you buy an almost new car you would expect it to be almost perfect, but a ten-year old car with tens of thousands of miles on the clock cannot be expected to be as good quality. Complaints about TVs were second on the list from Consumer Direct. This figure was up by nine per cent. With televisions and other electrical items bought new, you have rights under the Sale and Supply of Goods Act to expect your goods to be of satisfactory quality, as with used cars. What you may not know is that if a fault develops with your new TV or electrical item within the first six months of you buying it, the law assumes that the fault was present at the time you bought it and you are automatically entitled to redress. If the trader believes that the fault wasn’t present when the item was sold, it’s up to them to prove it, and not your responsibility to prove otherwise. So if your expensive HD television won’t switch on after three weeks, it’s reasonable to expect a refund, or an exchange. After five months and three weeks, you would still be able to ask for a free repair, but not as likely to get a completely new TV. Complaints about laptops recorded the highest rise, from 12,395 in 2008 to 17,611 in 2009, up 42 per cent, and were number five on the most-complained about list. Complaints about mobile phone service agreements were the third on the list of problems reported. If you buy a mobile phone, you need to be connected to a network in order to use it, so you often take out a line rental contract. By doing this you will enter into a contract with the Network Service Provider. If they don’t give you the service you’ve signed up to, you could be entitled to a refund, compensation or both from the service provider. The situation gets more complicated if you buy a phone through an agent that arranges your contract with the provider, but legally, for faults with a handset bought independently from a trader, your rights are against the person who sold you the phone. If the complaint is about the service, you should complain to the network provider you have the contract with. If there is a fault on the network or SIM card, you may be entitled to compensation. I was trapped by my wrist when my storage bed gave way,I tried to lift it in panic with my other hand and tore the ligaments in my back,Argos gave me money back for faulty bed but I am left 3 months down the line in agony,when the the men came to take the old bed back they said it happens all the time with this make of bed.I have another double storage bed from Argos and single they are a different make and have never fallen.I have paramedics hospital and doctors reports that would back me up please advise on who to contact to help me claim against insurers I have there address ,I was offered £50 compensation but refused as the bed was faulty and Argos no longer sell this make of bed.The doctor doesn't know how it didn't crunch my wrist please who do I phone about this? You could try do this yourself, send copies of any medical evidence, together with details of the hours you have lost work and any problems that you've had since (i.e. things you are unable to do that you could do before the injury). Ask for a specific amount of compensation to cover this. You will need to send this to the Argos head quarters address. If you're not comfortable doing this or it is unsuccessful, see an injury claims specialist who will advise you or your chances and what it might cost to make a claim. HII had buy some products for hair loss from one the private clinics company.They provided me products like shampoos,conditioners,hair lotion or hair oil,and laser treatment.I was contracted with them to take treatment until 9 months and paid full amount £1500 from my debit card.But unfortunately I stopped after few months and cancelled the the treatment because of worst improvements.Instead improving I lost my more hair which made more clear scalp or more bald and patches.At last I requested them to refund money of my remaining treatment but they refused to do that.The terms and conditions for the termination of contract or treatments are very unfair to me to get my money back from them.For the proof I captured some photos before and after the treatment which can prove the bad improvements of the treatment.I had also email to them but they want me to join treatment again but I am not happy about that.And also I send formal letter to resolve my problems.So please can you help me to get my money back from them? Unfortunately we do not have all the details of your contract etc. If you take them to the Citizen's Advice Bureau they may be able to help. HI I had buy some products for hair lossfrom one the private clinics company.They provided me products like shampoos,conditioners,hair lotion or hair oil,and laser treatment.I was contracted with them to take treatmentuntil 9 months and paid full amount £1500 from my debit card.But unfortunately I stopped after few months andcancelled the the treatment because of worst improvements.Instead improving i lost my more hair which made more clear scalp or more bald and patches. At last i requested them to refund money of my remaining treatment but they refused to do that.The terms and conditions for the termination of contract or treatments are very unfair to me to get my money back from them. For the proof i captured some photos before and after the treatment which can prove the bad improvements of the treatment. I had also email to them but they want me to join treatment again but i am not happy about that.And also i send formal letter to resolve my problems. So please can you help me to get my money back from them? Question, I was taking a four day break in a caravan.First night the alarm in the caravan kept me awake all night. Reported it following day. On return to caravan everything seemed ok until 1.45 when the alarm woke me again I packed my belongings and left the caravan site at 2.15 am leaving keys and a note in the box at reception.Not once have the company contacted me I have had to contact them to find out what the are prepared to do about the situation.Finally 6 weeks later I have received an email offering me monies off a further holiday with them with lots of conditions attached ie. Not transferable. Is this all I can expect or am I entitled to monies being returned to me. I purchased a caravan and had agreed that the damaged skylight would be replaced.When contacting the service depth say it's on an 18 week delay. However I can purchase it online with 48 hour delivery.They tried to get me to accept an inferior replacement that they could do straight away.Where do I stand? @Nil. You have not said whether a finance arrangement was made with the car dealer (in which case there is a possibility you could get out of it) or that you signed something to say that the deposit was non-refundable (difficult to then get your deposit back unless there is a fault or something else that relates directly to your actual consumer rights). Finding a cheaper care elsewhere would not normally be sufficient for returning your deposit unless there is a price match guarantee in place? But it's worth a try. hello can you help me I put a deposit on a car but after searching around on the price of the car I realize I m paying too much for the car. can I get my money back? Like Sharon, my first Rangemaster fridge cracked, it was 13 months old and was replaced immediately by Rangemaster. The second fridge has cracked everywhere and I am furious to be told it is just cosmetic, I paid £1300 for it to look cosmetically nice!.They have asked me for another £300 to provide a replacement,the cracks just get worse, Rangemaster are just ignoring my questions. I may be £1300 down but they are losing their reputation.I hope you will put me in touch with Sharon as I am contacting others for help with this problem. My daughters p.c Sony was repaired over a two month period due to technical problems and finding the necessary parts. The repair cost was almost three hundred pounds and seven months later the problem reappeared. Do I have any consumer rights regarding a refund or at least a better repair? I had a fully fitted kitchen fitted between Feb and March 2012 by a kitchen company I had Siemens appliances fitted as I thought they had a good reputation. The dishwasher worked for a few weeks but has now stopped working properly they have been out once and say its fine-I still have same fault the programmes do not change or work unless it is switched off at the mains a few times and put on again, which worries me as it is so new. Siemens have offered another repair and said it is up to the retailer. I contacted the kitchen company and this is their response "We are not able to authorise replacements as the product warranty is with Siemens. Siemens as a company will not replace a product unless the appliance has three call outs from their service department and the fault is still not resolved. All Siemens products are supplied with a two year warranty (with registration). Unfortunately I can not authorise a replacement for you, and can only advise that another service call be carried out. If you can let me know the day of the previous service call and the job reference number I can ensure that another engineer calls as clearly you have a fault which he did not see" I am unhappy with repairs to such a new appliance can I insist on a replacement? could you plese help me in this situation with my landline/broadband provider. there was a missing payment on my account and have made several call to my provider but all i get was " we will look into it and they went ahead to restrict my line, i tried again to complain about the service but there response was i have to pay the outstanding balance, but they fail to address the issue of the missing payment for 2months. please what can I do and how you can help me because i am suffering from emotional distress at the moment.